If you are a regular reader of Entertainment Weekly, then you might have seen the first photo of the upcoming Iron Man film they published last week. The picture got such a huge fan reaction in the blogosphere that Paramount decided to release a high resolution version of the photo. Jon Favreau (Swingers) will direct Iron Man. Robert Downey Jr. (Less Than Zero) has the lead role of Tony Stark/Iron Man. Gwyneth Paltrow and Jeff Bridges have also been cast in the film. 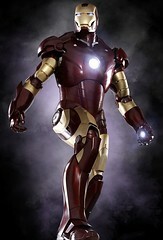 Iron Man is slated to hit theaters on May 2nd 2008. The high rez photos are definitely worth checking out.